Visit us to experience this amazing advancement in spinal care. Physicians and engineers collaborated to develop the Ultralign Spinal Care Technology. This was done because of the need to improve spinal care. This revolutionary system has significantly provided greater accuracy, effectiveness and comfort for patients and doctors. Advances in the ability to digitally assess patterns and degrees of movement were originally developed by NASA. They were used in the aerospace industry to monitor the movement of ceramic heat shields on space shuttles as well as the integrity of the hulls of airplanes. Using sophisticated and highly accurate sensors that register types and amounts of movement, a small pressure could be applied that would then indicate the nature and amount of movement present. This basic concept was then applied and improved upon to diagnose and treat human function! The Ultralign Spinal Care Technology incorporates this technology using computerized instrumentation that isolates normal versus abnormal movement in the spine. 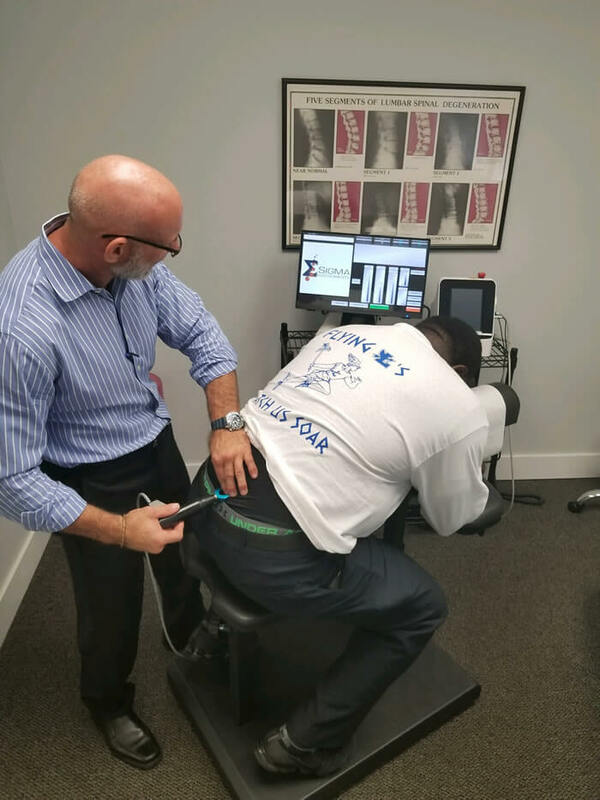 Doctors then use that information to determine where to treat and, using the same instrumentation, very gently and accurately correct the function and integrity of spinal movement. Best of all, this is all done while the patient is in a thoroughly comfortable seated position! The Ultralign System is what I have been waiting my whole career for. It is a complete game changer in the field of chiropractic and in the art of correcting spinal dysfunction. Now I can accurately and reliably scan, find the areas of dysfunction, make a correction and rescan to see the results. I test, not guess. Finally, technology has successfully married with the chiropractic adjustment.